The macaron is made in many interesting flavors in France. The filling is what is most often varied, but the macaron batter is also made with different flavorings. Some fillings to consider: raspberry jam, lemon curd, chocolate ganache, buttercreams of all kinds, dulce de leche. To flavor your batter try rose water, espresso powder, mint extract, grated citrus rind, or cocoa powder. 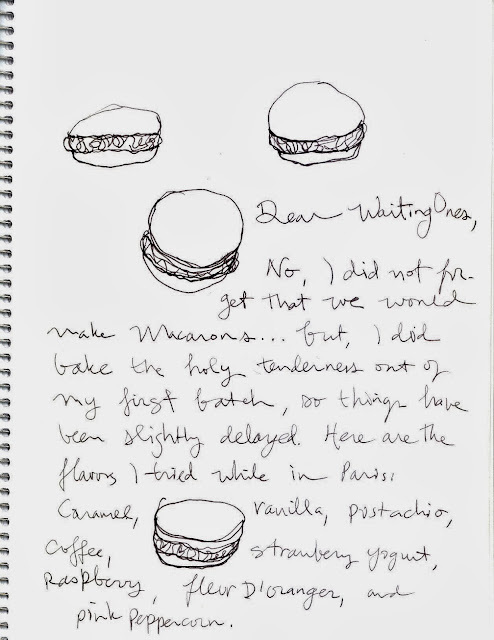 I reviewed many macaron recipes. My version is most indebted to the recipes of Jacques Pepin and Martha Stewart. This recipe will make only a few macarons- 8, maybe 12. The recipe can easily be doubled or tripled. Testers at the Dodo found these to be more delicious even than the macarons we ate a few weeks ago in Paris. These have a filling that is tres French: Marron, or chestnut. I can't wait for you to taste them! Put the almond meal and powdered sugar into a blender or food processor to break up any clumps of sugar or almond. Whip the egg white until it foams; add the smidge of salt and continue to beat until soft peaks form. Add, slowly, the 4 teaspoons of granulated sugar. Beat until fairly stiff. Add the vanilla bean seeds. Fold the almond and sugar mixture into the egg white. Mound or pipe the mixture onto a parchment covered baking sheet. Make them one to two inches wide; leaving about 2 to 3 inches between each mound. If there is a little peak on the top, smooth it down with a wet finger. Let these trays sit for at least ten minutes, while you heat the oven to 300 degrees. Bake them for 12 to 15 minutes. You do not want them to become crisp inside. They could take as long as 20 minutes, depending on your oven and the size of your mounds. Let them cool on the baking sheets. When completely cool, carefully lift them with an offset spatula. Pair them up into likely looking couples, and make the filling. Blend the butter with an electric mixer until it is fluffy and pale. Add the chestnut cream and vanilla and continue to beat until it is well mixed and sufficiently light in texture. Put a daub of the butter cream between the two mated macarons and you also will regret nothing! You may use blanched almonds or almond slices, ground up to a powder in the food processor, or you may use an almond flour that is pre-ground; like Bob's Red Mill, or Trader Joe's Almond Meal. To get vanilla bean seeds out of the pod, you must have a soft and flexible vanilla bean. If yours are stiff, let them soak in a shallow pool of vodka or bourbon for a few nights. If you like, you may join them. After this period of debauchery, your vanilla pods should be able to be split lengthwise with the tip of a sharp knife. Then, use the knife's tip to scrape the tiny damp black seed from the pod and shepherd it carefully into your egg white mixture. An excellent place to buy vanilla pods (and they arrive in perfect flexible form, no soaking required) is Vanilla Saffron Imports. Their vanilla extract and saffron is also top drawer. Chestnut cream is usually sweetened- if you cannot find it, but you are able to locate unsweetened chestnut paste, you may use the paste, after you have added some powdered sugar to it. Add the sugar to taste. If you are only able to find chestnuts; pas de probleme: Just put the shelled chestnuts into a food processor, puree, and add sugar to taste. If you become enthralled by chestnut, you must try the geophysically gorgeous Mont Blanc.